Are You Ready to Hit the Dog Park? In the Twin Cities, we’re lucky to have access to several fantastic dog parks. But are they a good fit for you and your pup? Dog parks come with a lot of pros including mental and physical exercise for dogs, the opportunity to socialize with their own species, and additional bonding time with their devoted human. Unfortunately, visits can also cause dogs stress and put their health and safety at risk. Humans can have negative experiences as well, often centered around bad encounters with other dog owners. Does your dog love other dogs? Does your dog have a lot of energy to burn? Does your dog respond to basic commands, especially coming when called? Is she fully vaccinated with flea and tick prevention in place? Altered (spayed or neutered)? Remember, not all dogs enjoy socializing with other canines or humans. If you or your dog are fearful, shy, anxious, or aggressive, the unique energy and dynamic of a dog park may not be a good fit. Some dogs who may face challenges at dog parks are seniors, dogs with health and physical limitations, and pups who are not good at reading canine social cues. Search for reviews of local dog parks online through Sidewalk Dog, Yelp, Google, Facebook or other reliable sources like your veterinarian, pet supply store, or Wagging Tails staff members. Visit the prospective dog park at least once to observe before bringing your dog. Brush up on basic commands through our Obedience Academy to ensure your dog is ready for their big day out. Learn basic canine body language and communication so you can effectively supervise your dog’s play and avoid conflict before it escalates. And, be prepared to safely intervene if a canine argument occurs. Is there a crowd? Are the dogs playing happily? Watch for potential troublemakers, it may be a good idea to come back later. Dogs are often eager to meet new arrivals at the dog park. Help your dog remain at ease by waiting a few minutes to enter the park while the others become accustomed to her presence. Pay attention to your dog!! Supervision at all times is key to ensure interactions remain positive and controlled. If she does not seem to be having fun or if questionable dogs arrive, leave immediately so the visit remains a positive one. 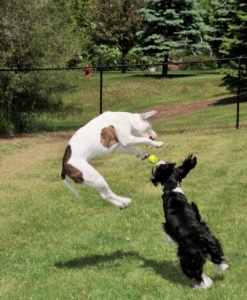 Pairs or groups of dogs playing nonstop can lead to overexcitement. Move to new areas of the park often and encourage your dog to follow you to keep her energy in check. Not ready to venture outdoors to the dog park? Start your dog with a doggy daycare “Playday” session and ask one of our Canine Coaches how you think she would do. Her safety and yours are our top priority.